I have gone on record, not least within these pages, to describe bass synths as basic synths that just happen to play low notes. Most of the time, I do not mean this in a particularly complimentary fashion, although there was one exception — the original Moog Taurus — where a basic synth that just happened to play low notes was a fabulous product that justifiably remains revered to this day. Moog discontinued the Taurus in 1981 and replaced it with the short-lived Taurus 2. Often described as a Rogue on a stick, this was much more flexible than its predecessor, but sounded different and was widely (and often unfairly) disparaged by the synthesizer community. Consequently, it wasn't until Moog emulated the original Taurus that a true successor was born. I reviewed the Taurus 3 in the July 2010 issue of SOS and was impressed, so much so that I bought one for my own use. Today we have before us the fourth in the series. This is a small desktop unit named, with horrible inevitability, the Minitaur, and in real terms it may be the most affordable Moog synthesizer ever released. However, it's not the basic, knobby analogue synth that it appears to be, because (with the exception of the fine-tune knob) every knob and button has an equivalent MIDI CC that can be used to control it from afar. What's more, while you can use it successfully in isolation, there are no fewer than 20 additional voicing parameters (that I refer to as 'hidden' and Moog calls 'under the hood') that become accessible when you use it with its dedicated editor software (see below) or another source of MIDI CCs. 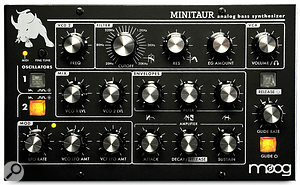 The Minitaur looks good in its traditional Moog livery and, at just 22 x 14cm, its front panel is certainly compact. But let's start at the beginning. 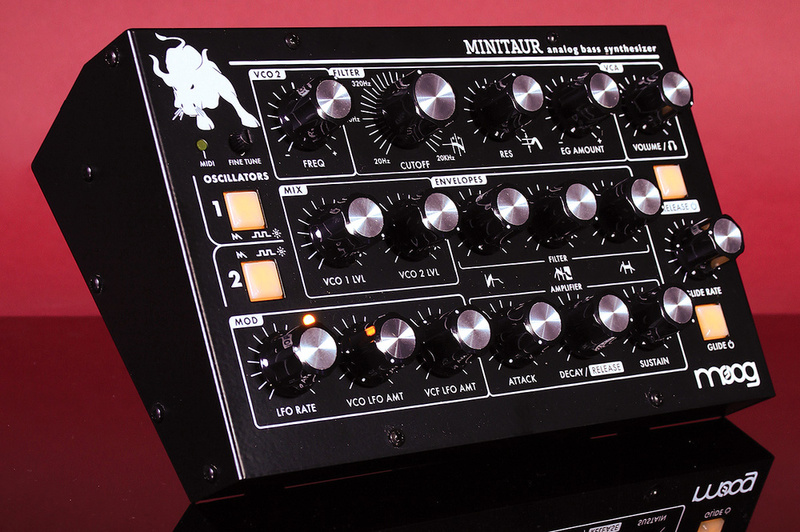 The Minitaur boasts two oscillators that can generate either sawtooth or square waves. You can detune VCO2 against VCO1 by up to plus/minus 12 semitones, and fine-tune the whole instrument within a range of plus/minus one semitone. Pitch bend is also provided, with a range of selected values up to plus/minus 24 semitones, and with the Up and Down amounts separately defined if desired. However, the pitch range lies only between MIDI Notes 0 and 72 (the 'C' an octave above middle 'C') and this is such a strict limit that you can't offset the pitch, detune VCO2 higher, or even pitch bend above this. In addition to all of this, there's a second hidden parameter in the oscillator section that deserves special mention. It's called Note Sync, and it forces the phases of both oscillators to reset to zero degrees when a Note On message is received. This is particularly useful when using detuned patches because, without it, the fundamental may be reinforced when you first play a note, attenuated (resulting in a thinner sound), or even cancelled (resulting in a sound that initially seems to lie an octave higher than wanted). Forcing the phase to align at the start of each note eliminates this. I can't remember when I last saw this (if ever), but it's very welcome, and I recommend that you switch it on. Having determined the waveform and pitch of the oscillators, you can mix them in what seems to be a simple two-channel mixer... except that it's a three-channel mixer. This is because any external signal presented to the audio input is mixed here before being presented to the filter. There's no physical control for the level of the external signal, but you can determine its gain using another MIDI CC, from zero up to 200 percent. The manual claims that setting the VCO levels close to maximum will overdrive the mixer to generate clipped (ie. 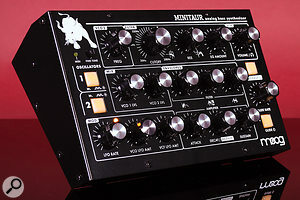 more aggressive) sounds, but the effect is at best very subtle, so don't expect monstrous, distorted bass from the Minitaur. Next in the signal path lies the filter which, as you would expect, is what the company describe as a "classic” Moog 24dB/octave low-pass design. This offers the standard controls for cutoff frequency and resonance and will self-oscillate when you increase the resonance beyond its two o'clock position. When I received the Minitaur, the cutoff frequency didn't track at 100 percent, but this can be adjusted using yet another hidden parameter, and a quick tweak set it to 100 percent, whereupon it could be played as an additional oscillator or used to pick out specific harmonics consistently as I played up and down the keyboard. You can also control the cutoff frequency using its dedicated contour generator, and you can even make the cutoff frequency velocity-sensitive (another hidden parameter), although I found the maximum depth to be rather subtle, which is a shame. Finally, as far as the signal path is concerned, there's a simple VCA followed by a volume control. Well, simple, except that you can use yet another pair of hidden MIDI CCs to control the VCA's initial level and make its gain velocity-sensitive. Unlike the Taurus, but like the Minimoog, the dual contour generators — hard-wired to the VCF and VCA — are ADS(D) designs, whereby the Decay control also determines the length of the Release phase (or not, as determined by the status of the Release On/Off button). Moog have been a bit naughty here, describing these devices as ADSRs but, given that you can't set the length of the Decay and Release stages independently, this is misleading. The fastest Attacks, Decays and Releases are each claimed to be as fast as 1ms, and they are, indeed, so snappy that, with the Attack and Decay knobs set to zero, clicking occurs. This can sometimes be interesting at the starts of notes, but it's always horrid at the end of them, so I never set the Minitaur's Decay knob to zero, even when I wanted notes to stop abruptly. (This, by the way, is a compliment, albeit a strange one.) Moog claim that the slowest contour times are as long as 30s, but I found them to be considerably shorter than this — not that this was ever a problem. Modulation is via a single LFO. This only generates a triangle wave, but has a wide frequency range from 0.01 to 100Hz. You can route the modulation signal to the oscillators (both VCOs affected equally up to plus/minus one octave) and the filter cutoff frequency (up to plus/minus five octaves), and control depth using a mod wheel or anything else that generates the appropriate MIDI CC. You can also sync the LFO to MIDI Clock, with divisions ranging from 64th-note triplets to four semibreves, and reset its phase whenever you play a new note ('LFO key triggering'), which is important if you want every note to be consistent. The final controls belong to the Glide section. There are three glide types, again accessed using a hidden parameter. These are Linear Constant Rate (the time between notes increases as the interval increases), Linear Constant Time (the time between notes is consistent, no matter what the interval), and Exponential (which is the type of glide found on the original Taurus pedals). There's also a hidden legato mode, which disables the glide unless you are still holding the first note when you play the second. As I said... it's not as basic as it appears to be! All of the Minitaur's front panel controls (except its Fine Tune knob) respond to MIDI CC numbers and can be edited via the Minitaur Editor software. But that's not all: the software also allows you access to a variety of other controls that are otherwise hidden, as seen here. Be clear from the outset; the Minitaur is not a Taurus 3 module. Although it shares some similarities with the Taurus 3, there are many differences, so while you can use the two for the same purposes, it will perhaps be more interesting to compare it with the original Taurus, which remains the iconic instrument of its type. But before doing so, let's get a small number of niggles out of the way. 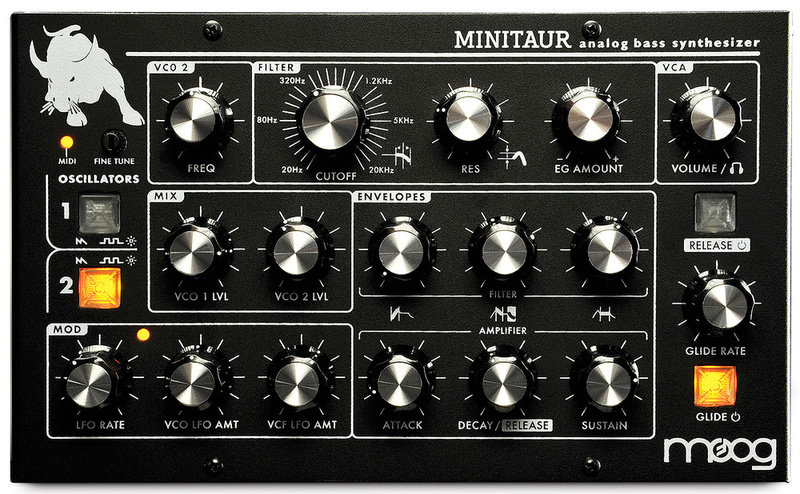 Firstly, Moog describe the Minitaur in numerous places as having a "one knob per function design”. This is not true. It would be true to say that it has a "one function per knob design”, but this is a different thing. 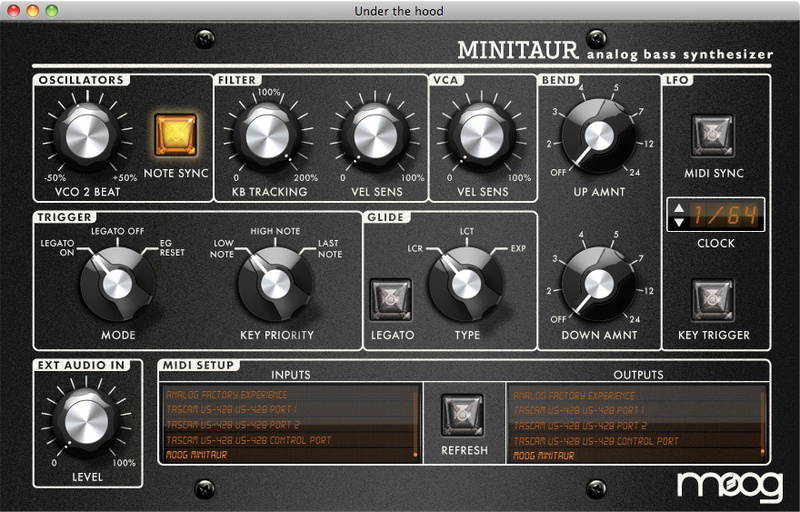 The Minitaur does not have one knob per function because many parameters are only accessible via MIDI. 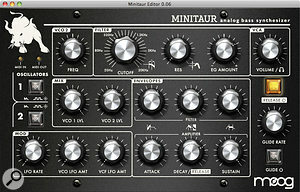 For much of the review, I had the Minitaur connected to an Arturia AE Factory keyboard and its associated MIDI Control Centre software running on my Mac and, towards the end of the review, Moog kindly supplied me with a pre-release version of the dedicated Minitaur Editor (see below), which proved to be a boon. Without these or something equivalent, much of the Minitaur would have remained inaccessible. Secondly, two of the parameters accessed by MIDI CCs — the note priority (high/low/last) and legato modes — are not described in the manual, and you will only stumble across them if you read the MIDI CC table in the appendices. Thirdly, I found that when I connected the Minitaur to my MacBook Pro, using the USB port next to its psu input, the synth generated a low-level, but nonetheless unacceptable chattering noise. Because I had encountered this once before, I recognised it as noise from the Mac's power supply, so I transferred the USB cable to the port on the other side of the computer. This reduced the noise considerably, but when I pulled out the PSU cable (leaving the Mac to run on its internal batteries) it disappeared entirely. I am not sure where the blame lies for this, but if you're planning to use the Minitaur with a laptop, it may be worth checking to see whether you encounter anything similar. Now let's move on to the good stuff, and address the question we all want answered: can the Minitaur play and sound like the original Taurus? To answer this, I liberated my Korg MPK130 MIDI pedals from the store room, hooked them up to the Minitaur and placed them next to my Taurus. Unfortunately, having not used my Taurus for some time, I had to open it up and go through its tuning and scaling routines. To be fair, this took less than an hour, but it pointed out an immediate advantage of the Minitaur over its ancestor! 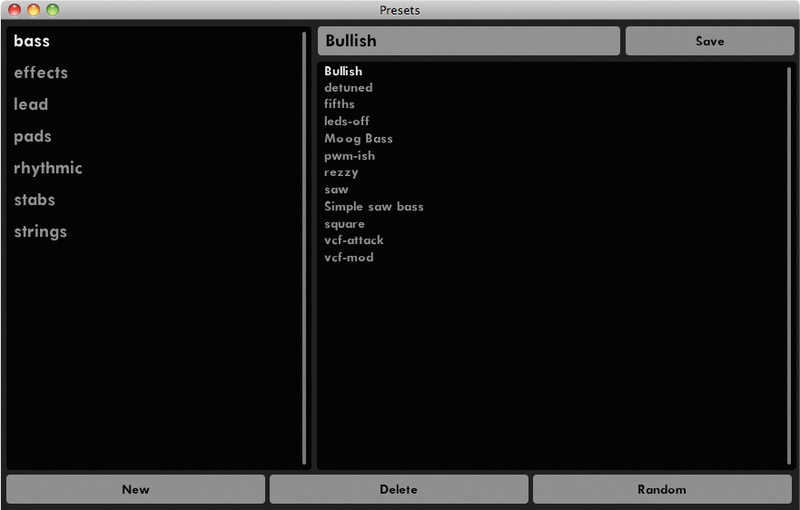 Presets can be saved via the Minitaur Editor software. 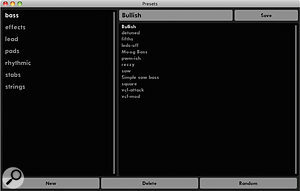 Having set everything up correctly, could I now imitate the decade-defining Taurus preset of the original pedals? The answer was, as I had expected, not quite. The original Taurus had unusual attributes such as a link between the Attack time and the contour amount, as well as coupling between the filter and the audio amplifier, and these had very pleasing sonic consequences, including a growl in its Attack phase that is very hard to describe, but recognisable when you hear it. So, given the much more complex synthesis architecture of the Minitaur, it's a compliment to Moog that the sound is close enough for most players and listeners not to give a damn. Would the subtle difference bother me? To be honest, no. I would be more than happy to record with the Minitaur or take it out on stage, and I am confident that neither you nor anyone in the audience would be able to tell the difference. Hmm... I had better qualify that statement. I should have written, I am confident that neither you nor anyone in the audience would be able to tell the difference unless I used the Minitaur to create and play the myriad additional bass sounds that it can generate with ease, but which the Taurus could only dream about. The Minitaur can receive MIDI data on both its MIDI inputs simultaneously, and also sends MIDI data from its USB port. Every physical control (again, except the fine-tune knob) transmits a stream of MIDI CCs when adjusted, which means that you can easily automate changes by recording and playing back these streams. The caveat is that the CCs are generated in 7-bit format, which means that you might encounter significant zipper noise when you replay the data. To demonstrate this, play and simultaneously record a self-oscillating filter sound while slowly sweeping the cutoff-frequency knob. There's a tiny bit of unevenness, but nothing to worry about. Now replay the recording. You'll find that the cutoff frequency has been quantised to semitone steps. This is not a criticism of Moog, just a consequence of the original MIDI specification. Happily, Moog have endowed the Minitaur with the ability to understand 14-bit MIDI CCs, which vastly increases the resolution. If you can create data in this format in your computer, far smoother effects are possible. 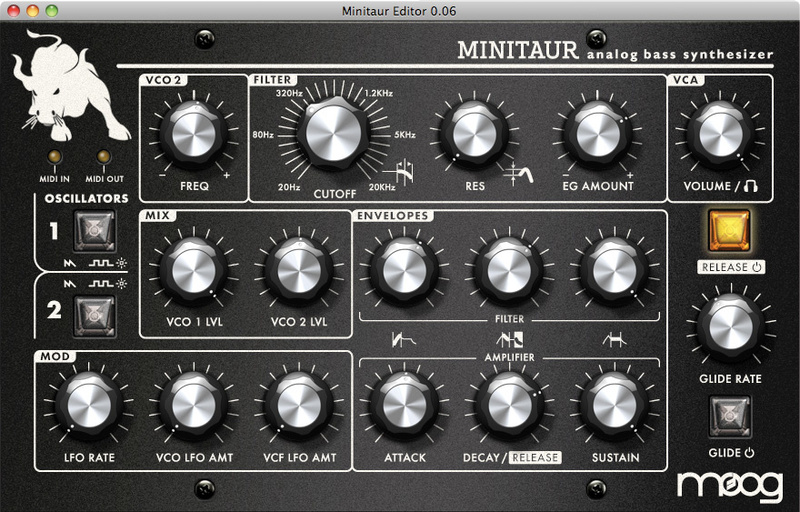 After you register your Minitaur, you will also be able to download its dedicated editor, which will come complete with any USB drivers necessary to hook the synth to your PC or Mac. Although the final version was unavailable at the time of review, the nice chaps at Moog Music supplied me with a pre-release version and software to update the Minitaur to be able to use it. Installation was painless, and within minutes I realised what a huge difference the editor makes. 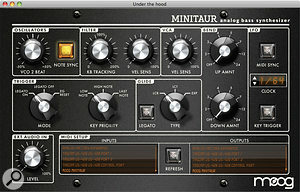 All of the Minitaur's front panel controls (except the Fine Tune knob) respond to MIDI CC numbers and can be edited via the Minitaur Editor software...The main page echoes the physical control panel of the synth, while a second provides a clear and simple means for accessing all of the hidden parameters. You can display these pages simultaneously (hurray! ), making it extremely quick and easy to edit the synth fully. Then, when you have developed a sound that you like, you can save it in a third (also simultaneously visible) page for later recall. A sensible range of housekeeping facilities is provided, so it's unlikely to be too long before you'll have complete libraries of bass sounds at your disposal. However, at the time of writing, the editor is a stand-alone application that doesn't integrate with host sequencers or DAWs. I hope that this will be addressed in the future, because it would be useful to be able to select new sounds while replaying songs. In the meantime, it should be possible to create and recall patches within a suitable sequencer using the appropriate MIDI CCs — laborious, but possible. One other observation: when idling, the editor consistently consumed in excess of 20 percent of my Mac's processing power (as reported by iStat Pro), and I have no idea why it should do so. This may be something that Moog will optimise before release, but I thought it worth noting. So is there anything I would change about the Minitaur? Well... yes, three things. Firstly, I would ask Moog to add aftertouch control of the LFO depth, filter cutoff frequency and loudness. Given that these are already under the control of various MIDI CCs, and that the Minitaur already knows when it's receiving aftertouch (the MIDI message LED flashes), it might be straightforward to add this as another controller. Secondly, I would ask them to consider creating a version with the hidden parameters accessible using physical knobs and switches. Sure, this would be much larger and significantly more expensive, but an enhanced Minitaur (the Miditaur or Maxitaur?) would be much more usable on stage or, for that matter, anywhere else where hooking it up to a MIDI controller or computer might be a pain. Finally, I would ask the company to provide a mounting kit so that the Minitaur could be used like a Taurus 2, with the synth itself standing at waist height above the MIDI pedal board. I have to admit that I find the Minitaur very attractive, and I would like to commend Moog on its clear controls and robust physical design. With a sonic architecture that sits somewhere between the Taurus 3 and the Slim Phatty, it does what it sets out to do with a minimum of fuss, and I can imagine that some players will be happy to use it straight out of the box without ever worrying about the additional facilities offered by the hidden parameters. However, one thing confuses me; I can't work out why Moog limited the Minitaur to bass duties. Sure, it does what it says on the tin, and it does it extremely well, but I created some excellent brass and flute sounds using it, as well as many other patches from the Moog pantheon, and it seems obvious that the Minitaur would sing as a lead synth too. Nonetheless, it's a descendent of the Taurus, and I should accept is as such. Whether a combination of MIDI bass pedals and the Minitaur will ever feel quite as 'right' as my Taurus is another question, but I have to admit that I thoroughly enjoyed using it in that fashion. Given the low cost of the Minitaur and all the additional sounds and facilities it offers, and given the second-hand value of the vintage pedals — which is still equivalent to the price of a brand-new Taurus 3 — I think that Moog may have a hot product on their hands. You can't easily compare the Minitaur to other dual-oscillator analogue monosynths, because they tend not to be limited to notes below MIDI Note 73. Furthermore, you can't really compare it to single-oscillator TB303 clones, because their architectures and the natures of their sounds would make such a comparison largely meaningless. Sonically and philosophically, you might want to judge it against the Taurus 3, but one is a neat little desktop unit weighing less than 2Kg, while the other is an unwieldy pedalboard weighing 10 times as much. Consequently, I suspect that the Minitaur occupies a niche all of its own. But whether it's worth as much as, say, the new Arturia MiniBrute keyboard or the DSI Mopho desktop module (both of which operate in an entirely different fashion, but produce excellent bass sounds and lie in the same price band) is another question entirely, and one that only you can answer. The Minitaur boasts two audio outputs — unbalanced mono audio on a quarter-inch socket and headphones on a stereo, 3.5mm socket — plus a quarter-inch audio input for processing external signals. At the other end of the unit, you'll find MIDI on both five-pin DIN (MIDI In only) and USB sockets, and an input for the 12V DC wall-wart, the use of which is forgivable in a unit of this size, especially since it's 'universal', accepting 100V-240V AC at both 50Hz and 60Hz. The manual describes how the CV and Gate inputs can be used with the company's CP251 Control Processor, and while the examples cited might seem trivial to experienced users of modular synths, they further illustrate ways in which the Minitaur offers more than a casual glance might suggest. Like other synths offering audio, CV and Gate inputs, it's possible to create 'paraphonic synthesizers' using the Minitaur. Take the audio from an analogue polysynth or keyboard and direct it to the Minitaur's Audio In and, if it has one, take its Gate Out and direct this to the Minitaur's Gate In. You have now emulated ARP's original 'Polyphonic System', and if you can also find uses for the filter and amplifier CV inputs, you can step well beyond the original concept, to create all manner of distinctive patches. You can also take the audio and MIDI outputs from modern synths and direct these to the audio in and MIDI In of the Minitaur to create paraphonic versions of contemporary sounds. Moog rather disparagingly describe this as "warming up sterile digital signals”, but I prefer to think of it as just another way to create interesting new sounds. It's small, robust yet light, and very neat. It produces many of the classic Moog bass sounds, and much more besides. It offers much in the way of MIDI and analogue control. I can't see why Moog limited the Minitaur to bass duties — it seems such a waste! You need to use MIDI CCs and the editor to take advantage of all of its facilities. The documentation could be improved. In 1975, the Taurus proved that doing one thing very well was worth more than doing many things adequately. On this basis, the Minitaur scores highly, and it's worthy of consideration by anyone looking for a dedicated bass synth. If you have a set of MIDI bass pedals (or even if you don't), you should definitely try it. Source +44 (0)20 8962 5080.